As a social media marketer, adding people on Google+ is a good way to get your brand some exposure. 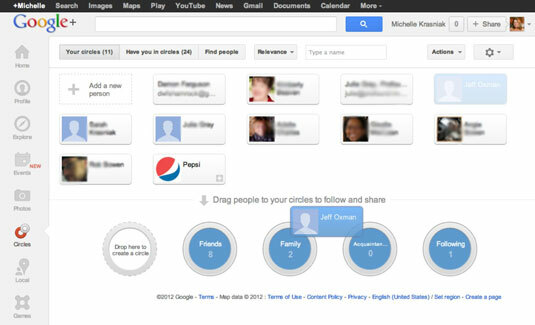 If you’ve had a presence on Google+ for a while, you may have already been added to other users’ Circles. Lucky you! These individuals are a great place to start when you’re looking for people to add to your Circles. In your sidebar menu, click the Circles icon. The default landing tab is Your Circles. Here you see any Circles you’ve created and whether or not they have people in them. The number of people in the Circle appears underneath the Circle name. Click the Have You in Circles tab at the top of the window. This tab can be found in the menu bar across from the Home icon on the left side of the screen. Here you see the people who have you in Circles. Click and drag the picture of the person you want to add and drop it over the icon of the Circle you want him to be in. After you add him to your Circle, the number beneath the Circle’s title increases, and that person receives a notification that he was added.